Welcome to The VAR Guy's Microsoft Worldwide Partner Conference 2012 InfoCenter. At WPC12, Microsoft discussed Windows 8, Windows Phone 8, Windows Server 2012 and Office 365 in great detail. Welcome to The VAR Guy’s Microsoft Worldwide Partner Conference 2012 InfoCenter. 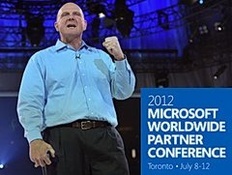 At WPC12, Microsoft discussed Windows 8, Windows Phone 8, Windows Server 2012 and Office 365 in great detail. But what exactly did CEO Steve Ballmer and Channel Chief Jon Roskill tell channel partners like VARs, MSPs and cloud services providers (CSPs) at the partner conference? Here’s complete news coverage and analysis from The VAR Guy and sister sites MSPmentor and Talkin’ Cloud. Complete day-to-day coverage from our anonymous blogger. Take a look and you’ll get a feel for Microsoft’s strategies across cloud computing and cloud services, server and applications software, desktops, and mobile devices (tablets and smartphones). Photo: Windows Phone 8, which Microsoft is pitching to mobile application developers. Can Linux Dance on Microsoft Windows SBS Grave? : Microsoft killed Windows Small Business Server (SBS) ahead of the Worldwide Partner Conference. Can Linux now invade the small business server market in a big way? Microsoft Tells Partners: Rescue Customers from IBM, Oracle: Microsoft COO Kevin Turner describes the company’s business strategy vs. IBM, Oracle, Apple iPad, Google Apps and VMware vSphere. Microsoft Office 365 and Cloud Revenues Doubling: Still skeptical about Exchange Online, SharePoint Online and Lync Online? Channel Chief Jon Roskill tells partners those cloud services are selling. Fast. VMware to Hyper-V Migrations: Microsoft Trains Partners: Microsoft’s “Switch to Hyper-V” program is seeking to ease VMware to Hyper-V migrations for virtualization customers, partners and cloud services providers (CSPs). Forty partners have completed the training so far. Here’s why. Windows Phone 8 for Enterprises, Consumers – Microsoft Wants Both: “Smart phone users today don’t know about Windows Phone, and that’s a problem we’re going to fix with Windows Phone 8,” said Charles Thomas Gruhler, technology marketing executive and branding strategist at Microsoft. Our coverage explains Microsoft’s strategy to fix that. Microsoft Confirms Windows Server 2012 Launch Date: When is the new Windows Server 2012 coming, and how will it support business servers, cloud services providers and partners? Answers have emerged at WPC. Microsoft Windows 8 Already Running on 100,000 App Macs: That stat comes from Parallels, which makes virtualization software to run Windows on Mac OS. MSPmentor is the top MSP blog and ultimate guide to managed services. In addition to the Worldwide Partner Conference content below, check out our annual MSPmentor 100 list, tracking the world’s top MSPs. Microsoft Company Hub for Windows Phone 8 App Management: Microsoft is preparing Company Hub, a Windows Phone 8 app marketplace platform that enterprises can run and maintain on their own. But will it offer Mobile Application Management (MAM) capabilities to MSPs? Microsoft Windows Intune Managing Apple iPad: Microsoft demonstrated a one-hour Windows Intune setup to today. It showed partners how to use the cloud-based service for PC management and mobile device management (MDM) for iOS and Android. The demo linked Windows Intune’s cloud service to on-premises Active Directory, Apple iPad and more. Microsoft Office 365 Open: One-Year Global Cloud Billing Rollout? : Microsoft Office 365 Open, which allows partners and VARs to manage end-customer cloud billing, will be available internationally before July 2013, a spokeswoman said. Office 365, Windows Azure vs. Amazon, Google Apps: How is Office 365 performing with channel partners moving into cloud services? And how can Microsoft partners most effectively compete with Google Apps and Amazon Web Services (AWS) in the cloud market? Microsoft Channel Chief Jon Roskill offers updates. Office 365 vs. Google Apps: Micrososft’s COO Rallies Partners: Microsoft COO Kevin Turner describes how the company’s Office 365 cloud competes with Google Apps. Windows Server 2012 for Cloud Services Providers: Microsoft is positioning the new Windows Server 2012 for CSPs and hosting providers, claiming the new operating system with Hyper-V can outperform VMware vSphere clouds. Office 365 Open: 10 Cloud Billing Questions for Microsoft: The new Office 365 Open initiative allows Microsoft partners to manage end-customer billing for Exchange Online, SharePoint Online, Lync Online and other cloud services. But the Office 365 Open effort raises as many questions as it answers. Microsoft Dynamics CRM: 60% of New Deployments in the Cloud: Fully 60 percent of new Microsoft Dynamics CRM deployments are in the cloud, and the Microsoft Dynamics business run rate is now more than $1 billion while delivering double-digit growth. Note: This section links to Microsoft’s website, offering you a look at Microsoft’s own statements and press releases, word for word directly from the software company. The VAR Guy and its sister sites did not produce this content.